Small & Homely or an Opulent Villa? Whilst there are certain elements that are common amongst any Tuscan style kitchen - such as color - a lot depends on the size of kitchen. An authentic, homely kitchen in Tuscany, will have a much different feel to that of a large Tuscan villa. What should always remain the same in an authentic kitchen though, is the feeling of gathering and family. 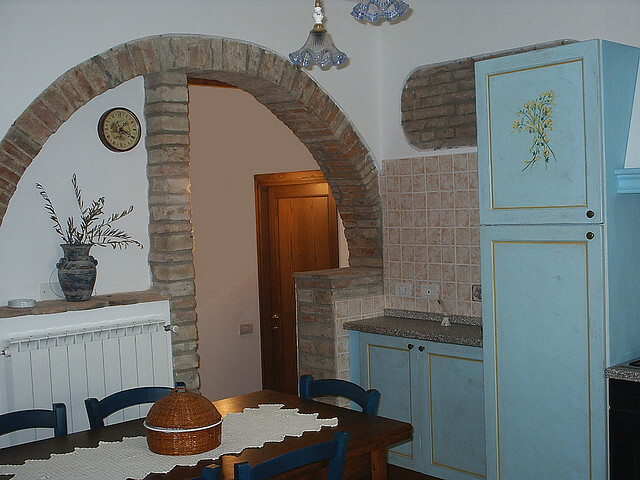 Italian kitchens are the heart of the home, and the decor should reflect this. A smaller kitchen may also house a dining table, where friends and family can gather to sit and help prepare vegetables for dinner, whereas a larger villa kitchen would be more likely to have a central island that appears more functional, but also encourages visitors to your home to gather. A Tuscany style kitchen can incorporate these colors in the form of painted walls, tiles, painted furniture, and large tableware. In keeping with the natural and earthy feel that Tuscans are so adept at creating, materials are natural too. Wooden cabinets are often painted, and countertops would either be tiles or wood. But in modern villas the use of stone and granite worktops would be more popular. The use of wrought iron pieces is also to be found in this decorating style, from light fittings to a cookbook stand. Why not make your walls more interesting by using a paint technique such as incorporating some painted faux cracks to add an air of authenticity as well as added visual interest. 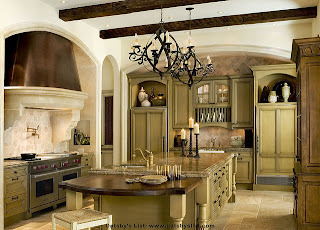 Cabinets in Tuscan kitchens are almost always painted in one or more of the Tuscany kitchen colors detailed above. They will often feature painted motifs, that reflect what you'd find in the backyard of an Italian villa - lemons, grapevines, sunflowers, and Cypress trees, are all commonly used. The only exception to this rule is in larger, more modern Tuscan villas where dark wood is the king of the kitchen domain, and would not be painted. 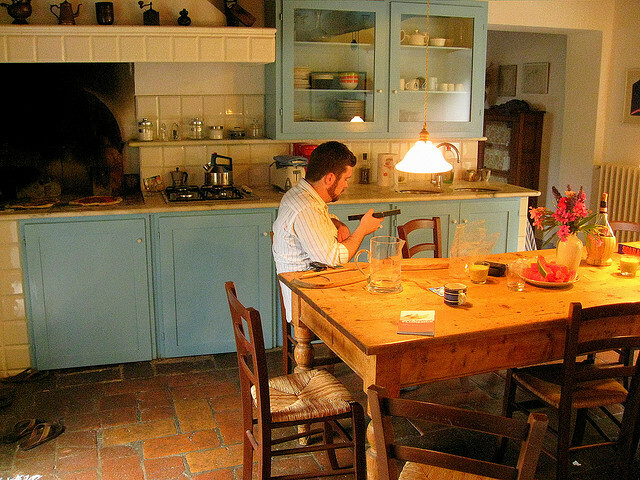 Tuscan people are also fond of open cupboards to display pottery, and pots & pans. Flooring in any Italian style kitchen will be tiled. These can be made from any natural material tile you can find, but are usually terracotta, clay, or glazed ceramic. You might also want to include a mosaic pattern to your flooring for added interest and authenticity. The mosaic style, or checkerboard effect, is commonly used as tile patterns on the wall in Tuscany kitchens too. As with all home decorating styles, a kitchen decorated in the Tuscan style will lack any authentic style, until the finishing touches enter the room, to bring the scheme together. Baskets are a common feature to have on the table or countertop, ready to pass round freshly baked ciabatta. Wrought iron features such as candlesticks, display shelves, or a rack to hang utensils from, would add authenticity to a Tuscan kitchen scheme. 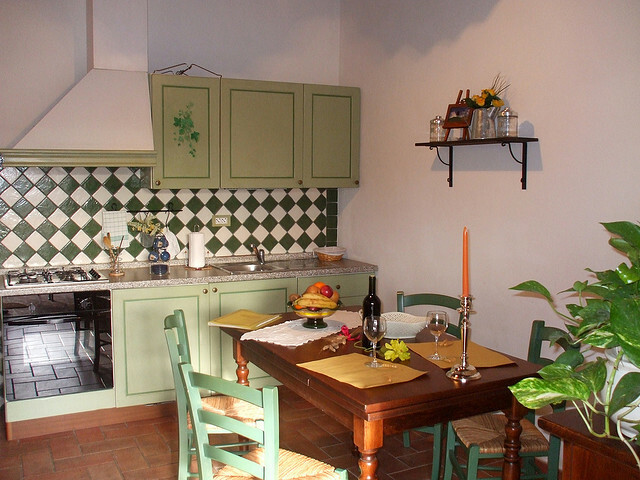 An Italian kitchen is nothing without bottles of wine and olive oil on the table, or on display in decorated bottles. Prints on the walls should again reflect the outdoors, using the motifs we looked at before, such as lemons and grapes. Large tableware, is a must-have in a kitchen to give it a Tuscan feel. Well worn, cracked, but big and beautiful. Often in rich reds and blues. Whatever finishing touches, colors or materials you choose to use in your Tuscany style kitchen, make sure you don't overlook the most vital ingredient - make it a warm and welcoming place for family and friends to eat, drink and be merry. Buon appetite!